BRT doesn't discuss politics to any great extent but when it comes to Syria and the potential for catastrophic disaster by committing unilateral military action against a country who poses no threat to the US requires that something must be said and Putin does this in very direct fashion by demanding absolute proof as to who actually gassed the Syrian civilians on August 21, 2013. Additionally, Putin's response is also a wake up call to Obama as this unnecessary and very dangerous gamesmanship he is playing regarding Russia, who's vital national interest is irrevocably connected to Syria, is not Libya, Iraq or Afghanistan by any stretch of the imagination. MOSCOW - Russia will be sending an anti-submarine ship and a missile cruiser to the Mediterranean "over the next few days" as the West prepares for possible strikes against Syria, the Interfax news agency says. To get a perspective of why Syria is a tar baby from hell, click here. Click here to see how the Great Game is being played in Syria. Click here to see how Syrian intel is being messaged. Last but not least, click here for a point by point rebuttal to the government's push for war. Addendum: Impeachment: Congress Fires Opening Shot Across Obama’s Bow. Two years ago, BRT showed the preview of Samsara, an absolutely astounding film depicting the state of humanity circa 2011. YouTube now has Ron Fricke's master work on line. Take the time to see this, you will be amazed. - Robert E.
$52.6 billion = the amount of money spent by our government to spy on us. Not bad for a years's worth of work (2013) if you ask me. What is quality? Can it be quantified, can it be defined or is it a notion requiring one to have the prerequisite intelligence, education and empathy to truly understand this most elusive concept known as quality. To this end, Chanticleer represents quality, quality in terms of how gardens should connect with nature, something organic, beautiful and inviting to experience, something this video hopefully captured during a walk through this truly enchanted place. Enjoy. To learn more about quality, Robert Pirsig's Lila is a good place to start. Quantum computers, the tech that not only presages hardware faster then one can possibly imagine is also a tech able to mirror reality itself. Check out PHD's terrific piece showing how these insane systems work. You will be amazed. To see how this disaster happened requires only a glimpse into the enormous power of the tsunami that overwhelmed one of the largest nuclear facilities in the world. With this in mind, check out the latest news regarding contaminated water and how it's spilling into the Pacific, a situation not good by any stretch of the imagination. Now that we know what overshoot means, we can now examine the ecological limits of planet earth. While economies, populations and resource demands grow, the size of Earth remains the same. Since the 1970s, when global ecological overshoot became a reality, we have been drawing down the biosphere's principal rather than living off its annual interest. To support our demands on nature, we have been liquidating resource stocks and allowing carbon dioxide to accumulate in the atmosphere. Ecological overshoot is possible only for a limited time before ecosystems begin to degrade and possibly collapse. Impacts of ecological overspending are apparent already in water shortages, desertification, soil erosion, reduced cropland productivity, overgrazing, deforestation, rapid species extinction, fisheries collapse and global climate change. Sound familiar? Overshoot Day has been advancing approximately three days a year yet is it? When BRT posted Overshoot on Sunday, September 25, 2011, the day was September 27. It's now August 20 so the 3 days per year estimate has been past by and then some. From this perspective, it seems mankind is committing slow motion suicide by plundering the planet for profit and keeping the status quo in power at all costs, something disastrous from the get go but we already know that, right? Check out the video below, needless to say, it makes one think about what the hell are we doing to the place "we call home." Addendum: Check out Climate Change 2007 to learn why this data should alarm every thinking person on the planet regarding what the future portends if we do nothing about it. Persistence and patience are the two essentials nature's creatures live by in making a living in an unforgiving yet beautiful place called reality. Enjoy and...check out the convergent evolution of the hawk-moth and hummers. Interesting to say the least. Yours truly is working on a project with direct relevance to healthcare, the incredibly complex and inefficient system America is burdened with, something IT, if properly applied, can help but only if a restart is done at fundamental levels to move HC into the 21st century where competition rules and the software in question is open sourced and able to scale, using the net as prime enabler. This terrific graphic shows the inherent complexity of healthcare and how IT intersects with it. Check it out, it's worth the time it takes to view this graphic in depth in order to better understand a system needing a reset and then some. Seen below is the info-graphic depicting how Big Data intersects with HC. Worthwhile to the max. A must see about why Texting can kill. Werner Herzog's heartfelt and powerful documentary should be mandatory viewing in high schools and college to get young drivers wise to the fact Texting can kill. 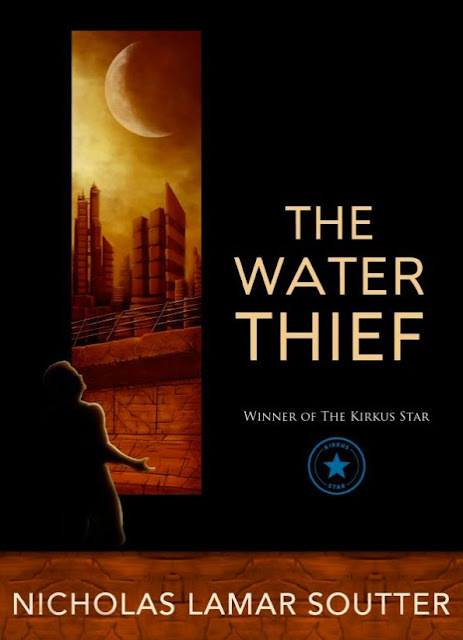 Just finished a really good book titled The Water Thief, the corporate version of 1984, a cautionary tale describing what the impact would be if unbridled capitalism ruled the world. “But when I saw the price of water I nearly choked. In the last hour it had gone up tenfold. Buying some more information, I learned that there had been an attack, this time at a water treatment facility in Brookhurst. A corporation from a competing Karitzu paid a mercenary firm to blow it up, and raw sewage was now spilling into the aquifer. My God! Did this happen before my shower? What about the toilet? Christ, I may have just blown six hundred caps on a single flush! Soutter also succinctly defines the proper role of government as well. She sighed. "Compared to people now, yeah, I think they were happy. Republics caused problems too, but for the most part they were an impartial third party that protected people. They had laws-rules nobody could break no matter how much money you had and a system to enforce those laws. And people did cheat the system, but enough power was left to the public that you couldn't leverage the whole thing. At least that was the theory of it all." If you can stand it, check out this masterpiece of The Hammer doing dance steps in Dancing With The Stars circa 2009, something to behold considering just how powerful and corrupt Tom DeLay truly was in his heyday as GOP House Majority Leader from 2003 - 2005 but he's not alone, not by a long shot as seen in a polemic by Frank Rich titled The Stench on the Potomac. This crowd is as intractable as it is incorrigible. There are no term limits, because Washington amnesia perennially wipes the slate clean. No one seems to remember anymore the furor kicked off by a 1998 Post "Style"-section piece in which Beltway grandees like David Broder and Cokie Roberts vented to Sally Quinn about how the impeached president had trashed their pristine city. "Regardless of whether his fortunes improve," Quinn concluded, "Bill Clinton has essentially lost the Washington Establishment for good." Well, that was then, and this is now. As This Town makes clear, these days Clinton alumni are the Washington Establishment, whether in the Obama administration or on K Street, and they can hardly wait for the greater dividends that will accrue should the former First Couple be restored to the White House in 2016. If that happens, Leibovich will not have to write a sequel, because it is already writing itself. Read it and weep because in the end, it doesn't matter... , ever. 1100, to yours truly, is a large number, particularly when it comes to articles written for BRT. It astounds me to no end that this blog contains this much material, hopefully most of which is relevant and has value. One can only hope. The 1000th article, titled 1000 & Counting, was reached on Jan 10, 2013 with emphasis given to quality of thought and the importance of Homer, the blind poet who started it all for aspiring writers willing to expose their thoughts to the public in a form able to be understood by anyone who had the skill set to do so. With this in mind, what has transpired in the 8 short months BRT went from article 1000 to post 1100? For starters, Orwell lives. Black white, double think and newspeak reign supreme in the land of the free as seen by the treatment of whistle blowers being equated to traitors, thanks to Obama and Holder, even though the definition of espionage cannot be applied to what Snowden, Ellsberg and Manning did in showing us how the government systematically lied to us in areas of policy that impacts us all. Global Warming, a reality accepted by all, save for flat earthers, grows ever more ominous as we continue to burn fossil fuels at ever increasing rates even though nations like Germany move ahead of us in terms of leveraging renewables to keep their nation running. Financialization, or the art of printing and manipulating money to feed the stock market, has replaced innovation as the "new" way to achieve financial success, a process equivalent to the game of musical chairs, where money, back by nothing and created from nothing, moves about at ever increasing speeds to temporarily satisfy immediate needs with the vain hope the music never stops though it inevitably will due to the ever increaseing cost of energy, the engine that kept the party going until now. Surveillance 24/7, something techies like myself have suspected all along, has been verified to be real at levels approaching disbelief, something most disquieting as surveillance is the first step to the creation of a police state, a condition this country is rapidly moving toward as seen by the militarization of the police, the increased control of the press via government wiretaps, the unprecedented concentration of power by the banks and corporations over government and the unprecedented attacks on whistle blowers of all types. States like PA are decreasing education budgets while building new prisons because prison building is a for profit system requiring ever larger prison populations in order for it to thrive, something that will definitely occur as the populace in question becomes less educated and must resort to crime in order to survive in a society increasingly driven by science and technology. Drug policy stupidity regarding the delayed legalization of pot continues on even though the so called drug war is our personal Vietnam and we've lost but the DEA and other law enforcement entities march on because that's where the money is and don't you forget it. On the local side, police want pot legalized in order to go after real criminals, not those charged with a victimless crime by getting toasted on a plant man has smoked for over 10,000 years. The art of stupidity and inefficiency of governance continues unabated with politicos spouting off policy initiatives that boggle the mind in terms of just how out of touch they and the powers at be are in terms of what is truly happening in America and to the world as a whole. The disparity of wealth is the greatest it's ever been and where the inequity stops, no one knows. Pensions are going the way of the dodo and banksters move ever closer to getting our social security as this is the only remnant of wealth America has left. Healthcare, don't even go there as the cost of getting anything of significance done, costs more in this county then in any other nation in the world. Obamacare is but a weak start to a system needing a reset and then some. Science & technology continue to advance in spite of attacks by religious fanatics of all stripes. Quantum computing, artificial photosynthesis and the ability to manipulate stem cells to create organs in the near future to save lives are examples of research that could transform society in ways unimagined just a few years ago. The demand for excellence is never stated in this country because learning something new is difficult, requiring sacrifice in order to become good. Intellectual prowess is also frowned upon because not everyone is smart, something not acceptable in this age of bloviators even though society itself needs people with brains to get the job done due to the inherent complexities of an environment dependent on science and tech in order to function. People are now demanding to know what foods are GMO and what are not because the environment and our health may depend on it. Needless to say, Monsanto and significant others are not happy about this. This also applies to water and the right to having unfettered access to it, something Nestle wants to, in effect, eliminate as it continues to buy up water rights in places all over the world in order to control access and generate enormous profits to the one essential element on which all life on this planet depends. Fracking and the XL pipeline are also being questioned. PA wants a moratorium on fracking to ascertain heath risks while opposition to Keystone is increasing at exponential rates given just how dirty and polluting the tar sands product truly is. Loser pays, the cessation of gerrymandering, the right to referendum and enactment of Amendment 28 are not happening, initiatives that need to happen if we are to take back control of this country. People are beginning to wake up and demand change. The question to ask is, can we make it happen before it's too late. As per many posts in BRT, the clock is ticking and we are running out of time. 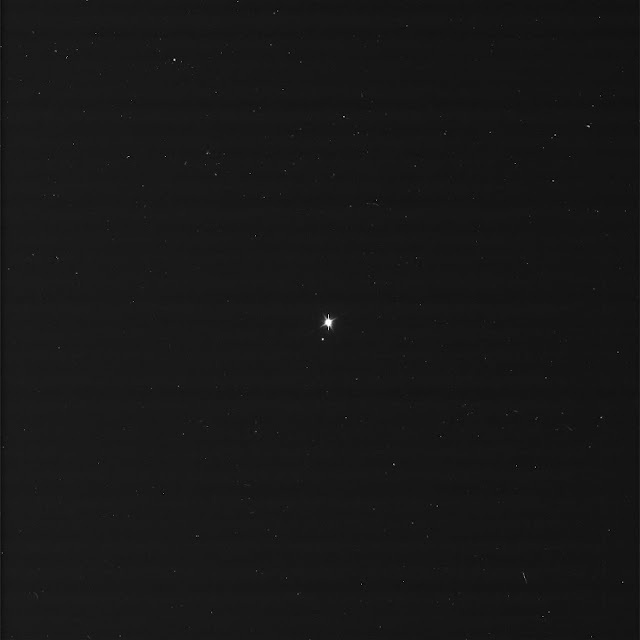 The image above is the Earth, Moon and Sun as seen from Cassini as I feel it's important to get a true sense of perspective as to where we really stand in this part of a vast, unknowable reality in which we inhabit, something we really need to think about if we want to succeed as a viable species on a tiny speck of real estate that, as Carl Sagan once said, "we call Home". Salon's take on the foibles of the US titled 8 appalling ways America leads the world is, without doubt, a must read. People uninterested in change and progress tend to cling to the jingoistic fantasy that America is an exceptional country. 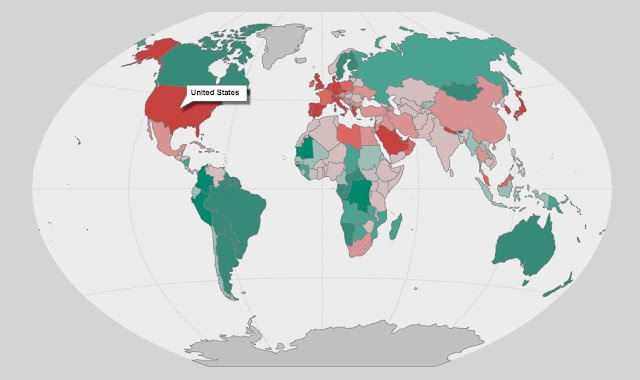 Often this implies that the U.S. is somehow superior to other nations. Some, like the neocons, have taken the idea of exceptionalism to mean that America should be above the law and that other countries should be remade in our image. Others, like conservative evangelicals, believe that America’s supposed exceptionalism is God’s will. 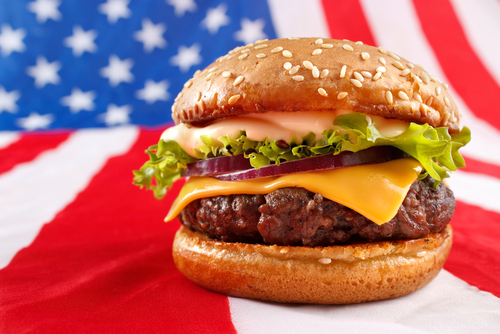 In recent decades, America has indeed pulled ahead of the global pack in a number of areas. But they aren’t necessarily things to go waving the flag over or thanking Jehovah. As a side note, yours truly recently visited friends in Quebec. Needless to say, diet, life style and the lack of fat people walking around town, is simply astounding, something America needs to fix, along with the other 7 factoids as seen in this truly informative article.